Film photographer, conservationist and explorer KT Merry premiered her first-edition photographs debuting her latest project, Render Loyalty, in New York City on Thursday, 11/17. With Render Loyalty as well as her heart and soul are among the wild, KT shared art with meaning through exquisite fine art photographs benefitting some of our most threatened species. The Lewa Series, a collection of 21 black-and-white fine art images in partnership with the Lewa Wildlife Conservancy – its vital work protecting threatened wildlife – brought to life the all-white space with never-before-seen images of threatened and endangered species in the wild. All of the fine art photographic prints, which are available in an array of sizes and options for framing, will continue to benefit the Lewa Wildlife Conservancy, a truly unique collaboration that KT hopes will further ignite conversations on how people and threatened species can coexist while also creating an active community in support of saving animals. Please find select images from the NYC premiere here and The Lewa Series by KT here. A northern Nevada native, KT has over ten years of experience in fashion and lifestyle photography. In 2007, KT launched her eponymous destination wedding photography business. Together with her business partner and husband Chad Keffer, KT has traversed the globe to photograph the world’s most exquisite destination weddings. A graduate from the Hallmark Institute of Photography, her work has been featured in top publications including Martha Stewart Weddings, The Knot, BRIDES, Town & Country, and many more. She was named a Rising Star by PDN Magazine and Top Wedding Photography by Martha Stewart Weddings. Behind every Render Loyalty image is a partnership years in the making. KT composes every image with her confidant, travel companion and husband, Chad Keffer. 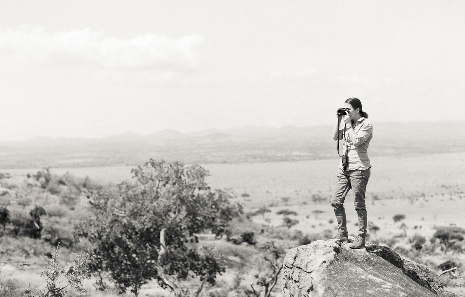 With a shared passion for animals, together they travel and document the magnificent animals of Render Loyalty. After years of working and traveling together, KT and Chad embarked on a worldwide adventure to remote regions of the globe to share the stories of conservationists and the glorious animals they protect. While you might not be able to travel to distant places to see threatened wildlife yourself, KT and Chad aim to bring the inspiring beauty of these animals into your home so that you can help contribute to their protection even from thousands of miles away. Visit https://www.renderloyalty.com/meet-kt-merry for more information. This entry was posted in Award, celebrity, honoree, Recognition, women and tagged animal protection, camera, events, film, globe, KT Merry, Lewa Wildlife Conservancy, meetings, photographer, protect wildlife, Render Loyalty, special events, The Lewla Series, Today's Honoree, travel for work, traveler, weddings. Bookmark the permalink.